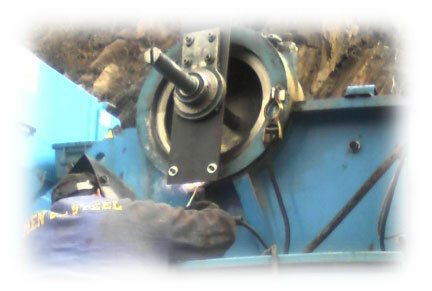 Portable line boring allows us to provide onsite repairs of worn or over-sized bores on loaders, excavators, and all types of heavy equipment. It is common for a mechanical bore to become worn in this field. They become egg shaped or worn to the point where they no longer function as intended. This happens due to high cyclic load, old age, lack of grease or some other factors. This portable service eliminates the need for transporting equipment, excessive teardown or removal of machinery from the job site. The result is less down time, less work and most importantly, less cost or lost revenue to your company. We can bore from 1.500 diameter up to 24" diameter. Lathe has a power feed with adjustable bearings, allowing precise alignment of bar (bar is 60" long).